Hello, I am Rachel Brooker, The Vinery's Beauty Therapist. 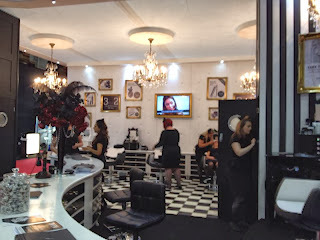 I specialise in HD Brows and was delighted to be invited this year to work on the HD Brow Stand at Professional Beauty 2013 in Manchester. This was my first 'trade show' and I had the privilege of working with other HD Brow Stylists from across the U.K, including Ireland & Scotland. Everybody working the HD Brow Stand were lovely and welcoming, which certainly helped to put any nerves I had to rest. It almost felt like we were one big family, working exceptionally well together as a team - it was also a great opportunity to swap tips, advice and experiences with each other as each Brow is different! The HD Brow Stand was very successful and by the end of the Professional Beauty Show we had almost sold out of all the retail products and ended up having to ensure that additional stocks were ordered for Monday morning after Sunday's phenomenal show! Both days were so busy and the time really flew by - I guess it helped that we were all enjoying being a part of it so much! We generally worked together in pairs and rotated between carrying out treatments and assisting the Stylist - explaining different stages of the treatment to the crowds of people watching each treatment taking place. Incredibly, about 100 treatments were carried out over the two days! Two Celebrity MakeUp Artists were there (one on Sunday and one on Monday) doing makeovers on customers using the HD Brow makeup. An exciting new makeup range will be launching early next year so keep a watch out for it hitting the shelves! I am hoping to work at the next HD Brow show at London Excel in February 2014 as I loved every minute of my experience at Professional Beauty and learnt so much from the other HD Brow trainers!! If you happen to be at the London Excel Show next year, pop by the HD Brow Stand for some expert advice or just to say hi!